Does your small business already take credit cards? Sick of either NOT taking credit cards or hassles navigating through a dizzying array of companies who do business for.. who does business for.. who process for… to find out what’s going on with your account or even for a simple question? AAACCCK! I was. Just trying to figure out who to contact was a real pain. Was sick of the monthly charge when I didn’t use my merchant account, and annoyed with trying to figure out the credit card options meant for much larger companies. I’m a small biz like most of you and what I needed was something simple that didn’t cost and arm and a leg and just worked with as little hassle as possible. SquareUp.com – This is an ideal service allowing the smallest of businesses to take credit cards anytime and any place! I ran across this last week at the suggestion of Technical Manager, Jim Singleton. Within, honest to God, maybe 3 minutes, the account was setup and I could have actually keyed in a credit card payment. No merchant account needed, no lengthy forms, etc. They DO ask for your EIN or SS#, so if you have bad credit, you may NOT be able to use this… but I haven’t seen the specs on their credit requirements so it may not be an issue. You will need to wait for 3 bank verification transactions after signup before you will be able to transfer money to your bank account – 2 debits and a credit that balance out to verify your bank account. After verification, you can initially do up to 1000/week transfer to your bank account. I suspect, based on all reviews and info I read, that this amount goes up once you start creating a good track record with the company. If you’re a bigger ticket item provider, then you may still want to keep your regular merchant account. But, if you’re like me and a lot of your transactions are under $200 AND on the road a lot, this may be the absolute greatest solution ever. Now the GREATEST THING? If you have a Droid phone or an iPhone or iPad, you will receive (and this DOES take a few weeks – haven’t received ours yet) a small cube that slides into your audio plug on those phones. What does it do? Allow you to swipe your customer’s card directly into your phone, capture the location of the transaction, and with the phone, even take a picture of the client to associate with the transaction. Price on all this? No monthly cost. Cost is 2.75% + 0.15/transaction swiped and 3.5% + 0.15/transaction for a manual keyed payment. I currently pay 3.25% on PayPal to accept payments and it’s not nearly as quick. You have to send a money request and hope the customer pays it in a timely fashion. With Square, you swipe the card ON the spot. There are no big card readers (nor their additional costs) to lug around, no trying get a signal to your computer (and tack on the cost of an “air card” so you can even ACCESS the internet) so you can login to a terminal to accept (and key in) the payment. There are only a few things required to setup your account. A free computer account setup app you’ll install to your main computer and then a free app that you can install to your Droid or iPhone. The icing is the small free attachment sent to you for free and you’ll be ready for your first swiped card transaction. 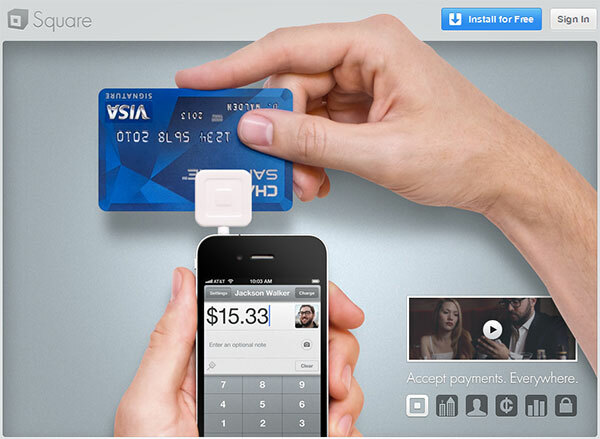 Square is the credit card service for everyone! It is small, quick to setup, charges reasonable costs and above all provides a lot of flexibility to the small business owner. I will be updating this post as we continue using this service! We got our first Cube Reader in and tested it out. Flawless. Opened up the Droid app, keyed in our test amount (a buck), swiped the card (magnetic strip DOES need to face the thicker side of the Cube), it gathered the GPS location of the transaction, we took a picture to associate with the transaction, did a digital signature with finger on the Droid screen and submitted. Done. Received within seconds a transaction report, and since it was a test, also received the customer receipt showing the amount, photo and map of location where it processed at. This Cube thing SO rocks. It’s got some features we would like to see such as full email capture and perhaps a bit more customer data capture, but it in reality is just a transaction terminal and not a full on POS terminal. Would also like to see ability to create subaccounts that can USE the service but not have full access to account online – for usage by my peeps in the field. But in those cases when someone wants to give a credit card – awesome. I would really like this for my craft shows but I absolutely will not transmit my social security number over the internet. My husband was a victim of identity theft and it took three years to clear up. Is there any other way? Not that I’m aware of Kathy 🙁 My two cents is that in the current environment, for the goodness that is online services such as PayPal, online banking, being able to take credit cards via a cell phone, there will be some risks that you have to take. I feel for you on the id theft issue though. Thankfully I haven’t been hit by that particular problem. Honestly though, I think it’s more common for either a hack at some repository of info holding credit card or ss numbers than just your transmission across the internet.